The winter holidays are already underway and it may or may not be kicked off with the re-launch of Starbucks’ Peppermint Mocha. For businesses looking to tap into the holiday sales, it is crucial to follow suit and rev up your holiday social media promotions before it’s too late. Here are 4 ways to cozy up your company’s holiday social media strategy. Cover Pages for Facebook, Google+, and Twitter are the biggest images on your business’ page and are a must to update. They are the perfect place to swap out with seasonal images and promotions, plus people love ringing in the holiday cheer. Be sure that your branding shines through the holiday themes too. There are a variety of things to post on social media related to the holidays. From bringing in sales to bringing out your company personality, these are just a handful of ways to fuel traffic to your site and boost your branding. Images, Images, & More Images! People on Pinterest are there specifically looking for shopping, inspiration, and ideas—make sure you’re on here, especially for e-commerce. Check out what kind of stuff is popular on here in case you’re wondering whether or not your products or services fit in with the audience’s interests on Pinterest. Create gift idea boards for different people, personalities, pets, and businesses and pin your products to the appropriate ones. People also love boards surrounding holiday decorations and favorite recipes. With all of the offsite holiday activity, don’t forget about your onsite traffic too. Blogs are great to share on social media as traffic drivers back to your site. Emails are also important as they easily target your ideal audience and customers that already purchased before. The ideas above are also easily translated to blogs, which you can then share on your Facebook, Google+, Twitter, Pinterest, and Emails. Blogs are a little more intimate and provide tips and insights on your products and services. You can also give advice for experiences such as How to Host a Holiday Party. Emails are great for promoting to early birds with gift ideas, sales, decorations, and recipes. This is also a good place to promote buy 2 get 1 gift cards or certificates for yourself, which is always enticing to regular customers. With so many ways to engage with your customers for the holidays through social media, it’s also important not to get so carried away online and remember that the holidays themselves are indeed an experience, a time for being thankful, spending time with family and friends, helping with non-profits, playing outside, and more. 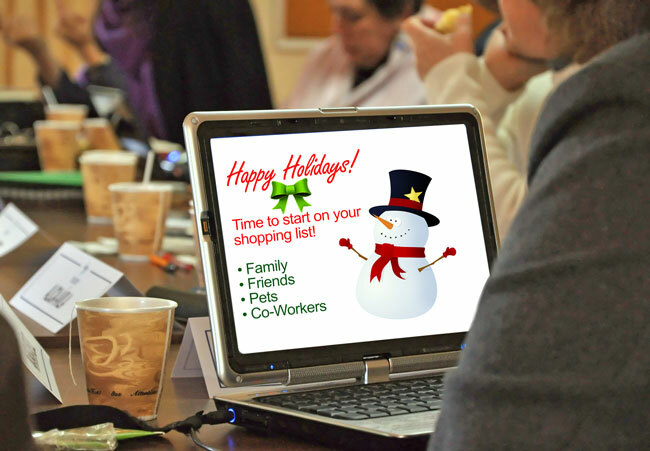 If you’d like some help with your holiday social media strategy, please contact us today to learn more.